Skidda's Row is the fourth level of Donkey Kong Country 3: Dixie Kong's Double Trouble! It is located in Lake Orangatanga. The name of the level is derived from "skid row." 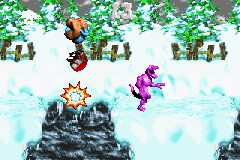 Skidda's Row is the first snowscape level that Dixie and Kiddy Kong travel through. As the name suggests, the level features the debut of Skiddas, who slide across the slippery ground and roofs of the snow-capped houses. There are also a few Krimps and Knik-Knaks. The Kongs must carefully travel through the level, as they have little traction, which may cause them to hit into a Skidda. 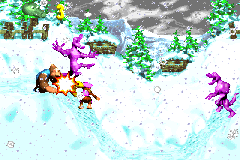 Skidda's Row also has a transitional weather pattern similar to the level Snow Barrel Blast from Donkey Kong Country: it starts out sunny and slowly develops into a snowstorm. The only difference is that the snowstorm settles down just before the Level Flag. When the Kongs begin the level, they head down a slope and then up a small hill with a snow-covered house at the top of it. A Skidda slips along the roof of the house, which the letter K hovers near. Bananas also line the front of the house. If the apes continue forward, they find another snow-capped house with a Krimp and a Bear Coin in front of it and a DK Barrel on top of it. They can find another Skidda ahead of here along a straight, snowy pathway. Shortly after passing the foe, they come up to another Skidda in a small alcove. They find an additional Skidda in a low area of land after two small pits. Once the primates climb up the hill following the enemy, they approach a Krimp and a hill with a Bonus Barrel above it. If they manage to cross a small abyss ahead of here, they can find the letter O and a hill with a Skidda slipping around it. The level's Star Barrel floats in the air after a steep slope ahead of here. Kiddy Kong approaches a house with a pair of Skiddas on it. About halfway into the level, the heroes clamber over a snow-covered rooftop with a Skidda on top of it. A trail of bananas next to the house lead the heroes towards a DK Barrel. After traveling down a short, flat pathway, the apes approach a Koin and a Steel Keg in an alcove. A hill is ahead of here with a pair of abysses at the bottom of it; the letter N sits on the platform between the two pits. The Kongs can find some stair-like structures ahead of here, and a few Skiddas slide along them. Once they climb the ledges, they reach a snow-bound house with a pair of Skiddas on it. A Bonus Barrel hangs above the house, and a Banana Bunch follows it. A curved pathway leading the Kongs down and up some hills is ahead with a lone Knik-Knak above it. If they jump on the enemy, they are given an Extra Life Balloon. 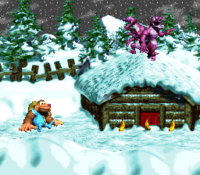 After passing a barrel, the primates reach a snow-covered house with two Skiddas on it that blocks their path. They must climb over the house and tread along a flat, snowy area to reach a small hill with two Skiddas sliding around it. The apes can find two small pits ahead with a platform between them that supports a Krimp and a few bananas. The letter G also hovers over the first pit. Once the primates climb up a hill that follows the pits, they discover a Level Flag that sends them to the next level when raised. Just before the letter O, the apes can discover a Bonus Barrel as they slide down a slope. After jumping into this barrel, they are sent to a Bonus Level, where they must defeat four Skiddas on some slopes within 10 seconds. If the foes are defeated within the time limit, a Bonus Coin appears at the end of the stage. Near the end of the level, the Kongs should find a Bonus Barrel above two Skiddas on a rooftop. If they bounce on one of the Skiddas or use their Team-up move, they can access the barrel and enter a Bonus Level. There, they need to move along some slippery platforms while avoiding Knik-Knaks and Skiddas. If they get to the end of the stage within 15 seconds, they can find a Bonus Coin to grab within the remaining time. This Bonus Level was made smaller in the Game Boy Advance version, while still providing the same amount of time. To the right of the first snow-covered house. Floating before the final pit before the Star Barrel. On the platform between two pits after the Koin. Hovering over the second-to-last pit in the level, located shortly before the Level Flag. After passing the Star Barrel, the Kongs can find a Koin holding the DK Coin in an alcove. To defeat it, they need to pick up a nearby Steel Keg and stand on the Kremling's shield. If they throw the barrel into a nearby wall, it will bounce off of it and hit the foe in the side, defeating him. Kiddy Kong should throw Dixie north-west while on top of the first snow-capped house to make her land in a hidden Warp Barrel that takes them both to the Level Flag. The Kongs travel through the level. Dixie jumps to the letter K.
Dixie jumping to a Bonus Barrel. A DK Barrel on a house. A Skidda running on the snow. Dixie and Kiddy grab bananas. Kiddy and Dixie using Team-up near a Bonus Barrel. The heroes approach some Skiddas on a snowy hill. This page was last edited on April 6, 2019, at 13:00.